Announcement Pain relief! Healing energy! Magnetic Therapy Jewelry that's stylish and handmade with love! Be happy with your awesome jewelry! Be Healthy because it's MAGNETIC THERAPY too! The best quality available! Fully warranted! Special requests are welcome! This is a trade friendly shop, just send me a message! Do you have broken magnetic therapy jewelry you'd like fixed? Do you want to match an existing piece? No problem, just send me a message! Pain relief! Healing energy! Magnetic Therapy Jewelry that's stylish and handmade with love! Be happy with your awesome jewelry! Be Healthy because it's MAGNETIC THERAPY too! The best quality available! Fully warranted! Special requests are welcome! This is a trade friendly shop, just send me a message! Do you have broken magnetic therapy jewelry you'd like fixed? Do you want to match an existing piece? No problem, just send me a message! This is a great anklet. Looking forward to wearing it regularly. Great quality materials and speedy shipment. This is not my first purchase from Happy Healthy and it won't be my last. Love their products. Thanks Windy! This is a really cute little ankle bracelet. It showed up at my door way faster than I thought it would. The magnets on this thing are no joke. You really have to pull to get them apart and be careful when you go to connect them that you don't get any skin in there! As for the medicinal benefit? I'm just not sure. I like to think that it's working but who knows. I have severe OA in both knees. I'm wearing the bracelet on my right ankle since that knee is worse. I was taking a prescription anti-inflammatory and I switched from that to something natural plus added this ankle bracelet and my OA is much better. So...not sure if it's the bracelet, the new natural supplement or just luck. It's pretty though and I'll keep wearing it. Bracelets, necklaces and anklets... Oh my! Windy Gilmore hard at work doing special requests at a trendy travelling boutique event. Awesomely convenient magnetic therapy watches are pre-made, then finished to the customer's size after they purchase it. Happy and Healthy magnetic jewelry frequents many arts festivals and higher end craft fairs. Jewelry that helps you be healthy in Styles that make you happy! Happy and Healthy magnetic jewelry all began with a friend who came back from snowbirding it in Arizona with a new hobby, making magnetic jewelry. As is the case with many of Windy's customers, the first necklace she bought was not for herself but for her husband. He had daily tension headaches and she figure it was worth a shot to see if the necklace could help. It did! The rest was history! Pretty soon the Gilmores were buying jewery for most everyone they knew at their request since pain was going away and people were feeling better! This kind friend taught Windy how to make magnetic therapy jewelry and where to buy the best supplies. That was over 10 years ago. Happy and Healthy magnetic jewelry can now be found on the arms, legs and necks of people all over the world. 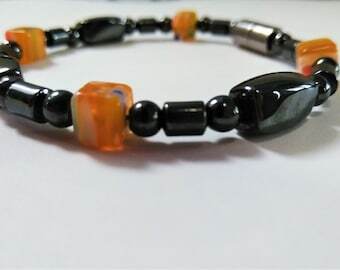 Company emphasis is on keeping the jewelry real magnetic therapy by using the strongest magnetic beads we can find on the market and being ultra picky about quality. We've heard hundreds of stories of real health benefits that customers have experienced. What a wonderful and gratifying way to make a living! Owner, Maker, Designer, Curator, I Do Everything! Windy Gilmore makes jewelry that helps you be healthy in styles that make you happy. She is in her 40's and is a West Coast girl currently living the life in San Diego County. Thank you for considering a Happy & Healthy purchase! My Happy & Healthy mission statement: To provide excellent magnetic therapy jewelery that helps people and pets look and feel their best! This jewelry is meant to be worn everyday for maximum benefit! Yes! I refund and exchange. I feel this is the most important part of excellent customer service! Since my jewelry is NOT one size fits all, but needs to be fitted to the individual... I have a very liberal exchange policy. If you receive your jewelry and it does not fit perfectly PLEASE let me know! I want to exchange it for a perfect fit! Usually I will ask that you include a $3 check to cover my return shipping cost. Please either be 100% happy with your jewelry or let me know! Exception for International Buyers- I will not refund orders that have been lost in the mail after tracking shows it left the United Sates. I accept all forms of payment that Etsy offers. Thank you. I ship United State Postal Service using bubble envelopes for the safety of your jewelry. For purchases inside the United States I give you the option of shipping regular mail or upgrading to 1-3 day priority mail. I include an invoice stating the purchase item and price, so please let me know in advance if this is a gift so I can omit the price information. International shippers: Please be aware if you are purchasing outside the United States that there may be additional customs charges due from your government before you can receive your item! Please contact your government to find out what additional customs charges may be added! You are fully responsible for the package once it leaves the United States of America. I will not refund or re-ship orders that have tracking shows left the United States safely. Yes! I do custom orders of all kinds! Yes! I provide a money - back guarantee, provided the jewelry is still in like new condition! Please look at my profile page for FAQ's about magnetic therapy do's and don'ts. Warning: pregnant women and those who wear pacemakers, insulin pumps or similar bio-electronic devices should absolutely consult their doctor before using magnetic therapy! !